Patio installation is intricate work requiring a high level of skill and extensive experience to perform correctly. 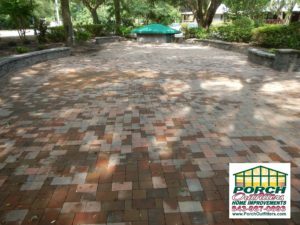 Do-it-yourself homeowners in Hilton Head, South Carolina, often find that they lack the tools and knowledge required to create a completely even and beautiful patio. Even worse, homeowners who hire sub-par installers who offer cheap products, such as stamped concrete, may find that their patio cracks and deteriorates quickly. Porch Outfitters has been the go-to patio installer in Hilton Head and all surrounding communities since 1987. We employ our own team of highly trained and experienced builders – not subcontractors – to install our patios and use only the highest quality materials. For example, we can build your patio with premium pavers from trusted manufactures, such as Belgard and Lowcountry Paver, or we can use natural stone materials, such as marble, flagstone, bluestone, and travertine. Our detail-oriented patio installation process along with our use of top-quality materials ensures your patio will be incredibly durable and maintain its beauty year after year. And, if you’d like to make any additions to your patio area, we’re the only company you’ll need. We can build everything from outdoor kitchens to pergolas to complete outdoor living enclosures, such as sunrooms and screen rooms. Learn more about the patio installation services that Porch Outfitters provides by contacting us today. We’re proud to serve homeowners in Hilton Head, SC, and all nearby communities.